Background: Internet is regarded as one of the most indispensable parts in our life, and majority of young and adolescent people interested in the usage of it, but in some cases, these uses are become out of the control which later on lead to a condition called internet addiction in which it will be the predominant life activity. Objective: A descriptive cross-sectional study was conducted on Kirkuk Technical Institute students from January 1, 2017, to May 30, 2017 to study, if there is any relation between the occurrence of depression and internet usage. Materials and Methods: The total number of students included in the study was 550 from different scientific departments after distributing a special questionnaire form prepared for that purpose, and face-to-face interview was conducted after receiving the written consent from them. Results: The study results show that 60.8% of technical study students and 47.3% of students from administrative departments used internet daily, while 46.0% of students of health department used it weekly. In addition to that 72.1% and 67.8% male students from technical and administrative departments used internet daily, while female students from all departments (technical, administrative, and health) used the internet monthly; in addition to that 53.1% of students from administrative departments have a depressive attempts which affects daily activity and work in comparison to 18.5% of students from technical departments. Conclusion: The study concluded that the time spent for internet was about 7–9 h/daily with the presence of a suggestive depressive symptom which affects daily activity and work. Recommendations: The study recommended that further advanced educational programs about the main adverse effects of the internet and the main possible ways to control its usage. The main innovation in the communication and informative technology field, especially in the internet lead to health and social effect on human beings. It has been reported that IA affecting human health, the suicidal attitude and the depression rate were increased which is regarded as the same as alcoholic and drug addiction. It has been published that IA prevalence rate in Turkish people vary from (1.5% to 24.2%) which is much higher among young age groups than others because of unsettled their personalities,, while in Turkey, it is varies from (1.1% to 18.9%). The normal healthy goal of internet usage is to obtain an optimal desired within suitable period without behavioral or intellectual affection on the human body, for that reason some people limit their usage to what they need only, while others cannot control their usage in which damage their daily work and social life. The importance of study is because internet is widely used by publicly and the over usage of it leading to health and social problems, especially among students. The aim of the study is to assess the association between internet usage and occurrence of depression among Kirkuk Technical Institute students. A descriptive cross-sectional study design was conducted on students from two stages in Kirkuk Technical Institute after receiving official agreements before establishing the study. The study was carried out in Kirkuk Technical Institute on different scientific departments (technical, administrative, and health). The study was conducted from January 1, 2017, to 30, May, 2017. The sample was randomly collected among 550 students from the first and second stages (250 students from technical department, 150 from administrative department, and 150 from health department). A special questionnaire form was distributed to them after receiving their written consent from them, and the data were collected by face-to-face interviewing after complete explanation of the main objectives of the study. The scale of adolescent addiction was used which was developed by Korea Centers for Disease Control and Prevention (KCDCP) during 2010, which is consist from question about the average daily usage of internet with four options ranged from. 4 = internet usage > 10 h/daily. Therefore, students having a high scores, they were more prone to develop IA. For depression measurement, a specific signs and symptoms were included in the questionnaire form according to Hamilton depression scale which are (feeling a tired, loss of interest, communication problems, remembering and making a decision difficulty, irritation and changing in eating habits). In addition to the above signs and symptoms, a single question of two choices answer with yes or no which is: Do you feel any hopeless or so sad that you cannot complete your work for the last 1 year ago? All the students used internet through their mobiles and laptops. All the students who are not having internet in their mobiles. A special questionnaire form has been prepared by the investigator utilizing available. Part 4 – Distribution of study sample according to level of depression. The data were collected through the use of special questionnaire which was presented to (3) experts in different fields, they were (2) clinical physicians, (1) community physicians, and (1) statistical experts. The results of reliability and validity were 70%. descriptive statistics by percentages and numbers for questions with yes and no answer, number, and others variables; the Chi-square test was used to study the relation if there is any relation between variables and significance is taken at level 5% (P < 0.05). The total number of study students were 670 distributed among three scientific departments. The number of students responded to study was 550 and the response rate was (82.1%). 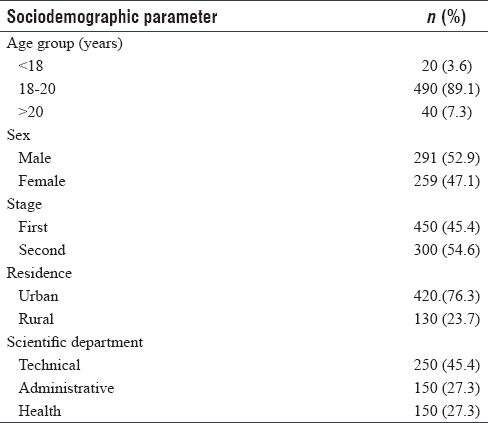 [Table 1] shows that male constitute 52.9%, aging between (18 and 20) years (89.1%), from the first stage (45.4%), 76.3% from urban area and 45.4% from administrative departments. [Table 2] indicates that there was a statistically significant relation between the studied groups, because 60.8% of technical students and 47.3% of students of administrative departments used internet daily with a P = 0.000. On the other hand, 46.0% of students from health departments used internet weekly with a P = 0.031. [Table 3] presents that 72.1% and 67.8% male students from technical and administrative departments used internet daily, while female students from all departments (technical, administrative, and health) used the internet monthly (27.3%, 41.0%, and 39.3%), respectively. [Table 4] shows that 45.4% of students of technical departments who were used internet daily, they spent about 8–10 h/while 50.7% of students of administrative departments who were used internet daily for about 4–7 h.
On the other hand, 64.9% of students from health departments used internet daily for about 4–7 h with a P = 0.003. [Table 5] presents that 53.1% of students from administrative departments have a depressive attempts which affects daily activity and work in comparison to 18.5% of students from technical departments and 19.3% of students from health departments with a P = 0.000. The current study shows that students from both (technical and administrative) departments used internet daily, while health students used internet weekly and this is due to their good knowledge and awareness of the side effects, and over load usage of internet which causing an addiction in the future. The same results were found by a study done by Ozgul et al. among 1st year students from Eskisehir Osmangazi University/2012, to assess if there was any significant relationship between the occurrence of psychological symptoms among study students and internet usage. They found that the mean score of IA scale was 8.28. They mentioned that the main reasons behind that was the necessity of internet usage by the student for research conducting and paper writing with the following up the lectures and sections. Concerning the relation of internet usage among study students according to gender, the present study show that males were widely used internet daily more than female students and this is because of sociocultural behavior which maintains her for avoidance from internet usage. Laith et al. prepared a similar study on 4388 students from JUST University in Jordan to examine and indicate if there was any correlation between the development of depression, signs of stress, anxiety and other psychological symptoms, and the occurrence of IA. They reported in their study that males were more profound to use internet than females and they blamed that differences because of the social media growth worldwide, and lack a deficient in the social control over all activities, especially internet like newspaper reading, chatting, and meeting new friends daily; unlike female groups who had a certain control and limitation on their duties and there was no any significant correlation or relation between gender and IA, which resulted due to a similarities between both males and females with referring to their families and associated pressure, academic structure outlines, and the students economic situation. Another study was conducted by Koo and Kwon in which they revealed that there was a significant relation or association between the gender and IA. They mentioned that the main differences in the density and content of education so, the level of internet usage is quietly different among students from variables colleges. Concerning the time spent for internet usage, the present study shows that about half of the students from technical departments used between 8 and 10 h/daily while more than half of the students from administrative departments used it about 4–7 h daily, while two-third of health department students spent 4–7 h daily for internet usage. Another study was prepared by Yoo et al. from a nationality sample of middle and high South Korean school students, their ages between 12 and 19 years after presenting to them a self-administrated questionnaire form through a type of a web-based survey to assess the main factors contributing to internet usage in association with mental health. They found that the prevalence rate of IA was 14.8%, and the usage was more among boys than girls for ≥ 4 h/daily, especially during the week ends. Further study was done in Vietnam among college students to determine if there was any linkage between internet usage and the presence of psychological symptoms. They mentioned that there was a weak-to-moderate correlation between these two variables and they reported that there was a quite correlation between gender and the time spent for its usage, especially at the weekends which is significant related with age (P < 0.05). The time which is spent for the usage of internet is very important factor for addiction state, because 40–80/h weekly or up to 20 h at one time may be the aggravating factors for hospital admission, and many studies have been mentioned that there was a strong association between the time duration of internet use and addiction occurrence. Regarding the depressive symptoms among the studied group, the current study show that about half of the students form technical departments who were used internet daily, they spent time between 8 and 10 h while more than half of students from administrative departments used internet daily for about 4–7 h in comparison to student from health departments who used internet about 4–7 h daily. A study was done at faculty of education/Cyprus International University, the international journal of global revealed that among studied group of male (80) and female (46), there were a strong relationship between the presence of psychological symptoms and over use of internet, and majority of them presents with a signs of stress, anxiety, and low self-esteem due to IA. Similar study was conducted by Romano et al., among 60 volunteer students in Swansea University/United Kingdom which show that there was a significant correlation between the longtime usage for internet and the appearance of depression. Further study was prepared by Yeh et al. in Taiwan, among college students to detect if there is any relation between the internet usage and depression. They found that there was a positive results between these two variables, and discussed these association by the difficult educational process which would be so hard and stressful, in addition to that a study burden with the living a way from family members and the presence of psychological problems, all these risk factors may increase the occurrence of depression among students which lead to IA. This study is very important in our life because of the current problem among students from different classes, and internet became one of the necessary and essential elements that cannot live without it, so over usage of it lead to many social and health problems. The study concluded that more than half of the students from technical and administrative departments used internet daily while less than of students from health departments, and the time spent for internet was about 7–9 h/daily with the presence of a suggestive depressive symptoms which affects daily activity and work. It is very quiet difficult to collect a questionnaire forms, the students because of the limited time and burden of the schedule with different scientific departments. The study recommended that further advanced educational programs about the health hazards of over usage internet with future more expanded studies and researches on wide range of population to assess the main effects of internet on human activities. Borzekowski DL. Adolescents' use of the internet: A controversial, coming-of-age resource. Adolesc Med Clin 2006;17:205-16. Weinstein A, Lejoyeux M. Internet addiction or excessive internet use. Am J Drug Alcohol Abuse 2010;36:277-83. Murali V, George S. Lost online: An overview of internet addiction. Adv Psychiatr Treat 2007;13:24-30. Block JJ. Issues for DSM-V: Internet addiction. Am J Psychiatry 2008;165:306-7. Beard KW. Internet addiction: A review of current assessment techniques and potential assessment questions. Cyberpsychol Behav 2005;8:7-14. Balcı Ayhan Ş, Balcı B. Ayhan University students internet use and satisfaction of a field research. Selcuk communication Journal 2007;1: 174-97. Batıgün AD, Anadolu P, Dergisi D. An evaluation of the patient internet addiction in terms of loneliness and interpersonal relation styles, Word press themes, 2010;11:213-9. Ceyhan AA. Predictors of problematic internet use on Turkish university students. Cyberpsychol Behav 2008;11:363-6. Petersen KU, Weymann N, Schelb Y, Thiel R, Thomasius R. Pathological internet use – epidemiology, diagnostics, co-occurring disorders and treatment. Fortschr Neurol Psychiatr 2009;77:263-71. Kim K, Ryu E, Chon MY, Yeun EJ, Choi SY, Seo JS, et al. Internet addiction in Korean adolescents and its relation to depression and suicidal ideation: A questionnaire survey. Int J Nurs Stud 2006;43:185-92. Lam LT, Peng ZW, Mai JC, Jing J. Factors associated with internet addiction among adolescents. Cyberpsychol Behav 2009;12:551-5. Chuang YC. Massively multiplayer online role-playing game-induced seizures: A neglected health problem in internet addiction. Cyberpsychol Behav 2006;9:451-6. Gong W, Li ZG, Stump RL. Global internet use and access: Cultural considerations. Asia Pac J Mark Logist 2007;19:57-74. Jiang P. Consumer adoption of mobile internet services: An exploratory study. J Promot Manag 2009;3:418-54. Akin A, Iskender M. Internet addiction and depression, anxiety and stress. Int Online J Educ Sci 2011;3:138-48. Korea Centers for Disease Control and Prevention. The statistics of 5th Korea youth risk behavior web-based survey (KYRBWS) in 2010. South Korea: Korea Centers for Disease Control and Prevention KCDCP; 2011. Ozgul O, Ozlem OR, Alaettin US, Sinan O. Evaluation of internet addiction and depression among University students. Soc Behav Sci 2013;84:445-54. Laith R, Maram A, Saleem M, Shaimaa B, Ghaith B, The relationship between depression and internet addiction among university students in Jordan. J Addict Res Ther 2017;6:4-8. Koo HJ, Kwon JH. Risk and protective factors of internet addiction: A meta-analysis of empirical studies in Korea. Yonsei Med J 2014;55:1691-711. Yoo YS, Cho OH, Cha KS. Associations between overuse of the internet and mental health in adolescents. Nurs Health Sci 2014;16:193-200. Zhang MW, Tran BX, Huong LT, Hinh ND, Nguyen HL, Tho TD, et al. Internet addiction and sleep quality among Vietnamese youths. Asian J Psychiatr 2017;28:15-20. Young K. Internet addiction. Am Behav Sci 2004;48:402-41. Tran BX, Huong LT, Hinh ND, Nguyen LH, Le BN, Nong VM, et al. Astudy on the influence of internet addiction and online interpersonal influences on health-related quality of life in young Vietnamese. BMC Public Health 2017;17:138. Romano M, Osborne LA, Truzoli R, Reed P. Differential psychological impact of internet exposure on internet addicts. PLoS One 2013;8:55162. Yeh YC, Ko HC, Wu JY, Cheng CP. Gender differences in relationships of actual and virtual social support to internet addiction mediated through depressive symptoms among college students in Taiwan. Cyberpsychol Behav 2008;11:485-7. Online since 27th December 2017.